A low-fat, low-calorie fish with a mild taste, cod takes on the flavoring of whatever sauce or dish it is prepared with. This white fish is packed with omega-3 fatty acids, vitamins A, B and D, as well as calcium and iron. 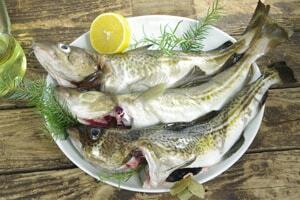 Cod has a meaty texture and very few bones.